Today marks the start of the Chinese New Year – the Year of the Rabbit. ﻿Part of today’s homeschooling focused on the Chinese New Year. I read the girls a book about Chinese New Year as well as a book that I’ve read to them in the past that they’ve enjoyed: The Runaway Rice Cake by Ying Chang Compestine. Preheat oven to 375 degrees. Combine all the dry ingredients ina large mixing bowl. Mix thoroughly. In a separate bowl, beat the eggs. Add the other wet ingredients to the eggs and stir. Olivia is adding water to the vegetable oil and eggs. Pour the wet ingredients into the dry ingredients. Mix well. Coat a 9-inch round cake pan with nonstick cooking spray. Pour in the batter. Bake for 40 minutes. The Nian-Gao will rise when done. A knife poked into the center will come out clean. Note: The dough comes almost to the top of the pan, so I put a cookie sheet underneath it just in case it rose a bit too much and overflowed. It didn’t, but it was worth doing. It took much longer than 40 minutes to bake. Either my oven isn’t hot enough, or it just takes longer than the recipe suggests. It took almost 55 minutes to bake. The Nian-Gao has a nice flavor to it. Everyone liked it. It’s especially good warm…right out of the oven. In addition to the Nian-Gao, we made sushi. Even though it isn’t a Chinese dish, it reminded me of when the girls were adopted from China. Many times – and at multiple restaurants throughout China – sushi was served. There was always a vegetarian sushi option which Sophia and I prefer. Olivia just likes the rice. As she says, “I don’t like to eat seaweed” (the green wrapping). a green onion on top of the sushi paper. Even though Olivia doesn’t eat sushi, she still wanted to peel and cut a carrot into slices. She passed on slicing the green onions. Olivia is working with the carrots while Sophia is rolling the sushi. Sophia is almost done rolling one of sushi roll. The rice is rather sticky. Once the girls were done with the nian-gao and sushi, they took a break while I put everything together in a muffin tin. Some of the items had a Chinese connection…others didn’t. The girls brought out placemats and chopsticks that are from China. They were purchased when Sophia was adopted in 2001. The girls starting to eat their Chinese New Year lunch. The theme this week for Muffin Tin Monday is “Favorite Foods.” I’ve been serving dinners each Monday night for the past several weeks in muffin tins. However, I was doing a lot of baking and cooking on Sunday and thought it would be good to do a muffin tin meal for Sunday night’s dinner. “It’s not Monday, Mom!” Olivia said. “Yes, that’s right. It’s Sunday,” I replied. Hmmm….I guess I didn’t realize that the girls had come to expect a muffin tin dinner every Monday night. How quickly routine can set in…and something for them to expect and to look forward to each week. The girls enjoy freshly-baked bread, so when I saw a recipe for foccacia in the new Taste of Home magazine, I wanted to try it. I’m going to add the recipe to the 52 Weeks of Baking cookbook I’m writing for Sophia and Olivia. The bread itself is very easy and flavorful. The toppings, as called for in the recipe, were thinly-sliced plum tomatoes, mozzarella cheese, and Parmesan cheese. These would be fine for most people. However, as Sophia said, “You could leave off the tomatoes and put something else on the next batch.” I agree. The tomato slices didn’t enhance the bread at all…maybe it was because they weren’t as flavorful as the tomatoes the girls and I grew here during the summer. – Brownies – made from a mix-in-a-jar that Olivia and I had made last month. Having all the ingredients pre-measured and in a jar make baking all that much easier when you need a quick dessert. All I needed to add was three eggs and a bit of vanilla extract. – Rice Krispie Bars – I make these dairy-free so Sophia can have them. Used up most of the Rice Krispies making the recipe and a bag of marshmallows. Cleaning out the cupboards in the process…always a plus. – Chex Mix – Used the recipe on the cereal box as a guideline, but didn’t have over half of the ingredients (e.g., garlic powder, onion powder, pretzels, dry-roasted peanuts). Substituted what I had on hand and used up all the Chex cereals, Spanish peanuts, and bagel chips. – Pizza Dipping Sauce – This is the Papa John’s Pizza Sauce recipe that I’ve modified a bit. The girls enjoyed using the dipping sauce with the foccacia. I’ve also made homemade breadsticks which taste very good with the dipping sauce as well. – Chicken Salad – Using up leftover chicken from a dinner a couple nights ago. Added fresh red pepper, celery, and chopped almonds to it. – Banana Bread – Used seven overly-ripe bananas (the best kind!) to make the bread. The recipe is from my grandma (my dad’s mom). Made the bread as muffins rather than in loaf form. – Deviled Eggs – Made several deviled eggs not following any recipe (served others on a plate since I didn’t want to put one egg in each spot in the muffin tin). This used up the remaining eggs in one carton. When I was growing up, my mom used to do dinners of leftovers on some Saturday or Sunday nights. Often, the items were just reheated in the oven and served in a variety of pans. It was a simple way for her to serve dinner and ensured there was very little food waste. This week, I wanted to do the theme of “Favorite Foods” with the goal of using what I had on hand. It’s nice to have a bit more room now in the cupboards and refrigerator now. The dried apples are ones that the girls and I made during the fall. We went to an apple orchard and got some apples. At home, I peeled and sliced them. The girls placed them in single layers on the different trays in the dehydrator. I sprinkled some cinnamon and sugar on top. Within a couple of days, the apple slices became dried apple treats. The picture of the third tray is rather blurry, but I still wanted to include it. The focus of this one is little since everything in it small (the individual shapes as well as the contents). 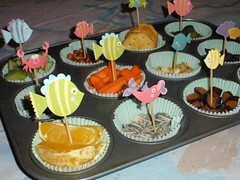 To see what other muffin tins were created with this theme, check out the Muffin Tin Mom website. This week’s Muffin Tin Monday includes a variety of vegetables, fruit, seeds, and meat. It was served with a simple dinner of noodle soup and homemade biscuits. The fish on toothpicks were made by attaching them to the back of a dimensional sticker. Tomorrow is Olivia’s 8th birthday and she asked to go to Underwater World at Mall of America (she wants to go there each year for her birthday). The girls also have been studying about the ocean and sea life. Of particular interest are the unusual fish and aquatic life at the deepest part of the sea. Although the girls won’t be seeing some of the fish they found intriguing – such as the angler fish, lantern fish, and vampire squid – they will see some interesting sea life that they have been learning about. Underwater World will bring to life what they read in the books we’ve been reading…a great way for them to learn! Looking down at the muffin tin. We’re looking forward to see the fish and other sea life tomorrow, and the sea life theme Muffin Tin Monday reminded us it’s less than 12 hours away! The muffin tin was almost empty by the end of dinner. some of the pumpkin and sunflower seeds. A while back I did Muffin Tin Mondays with my daughters who liked the idea of having their food in tiny bits and served in a muffin tin. 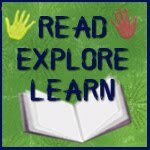 There’s a website that has a different Muffin Tin Monday theme each Monday, and participants can post pictures of what they created each week. 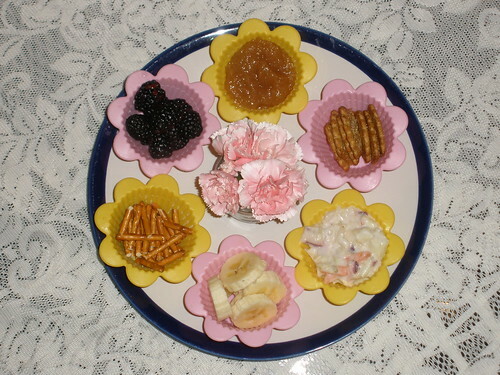 Michelle, who coordinates the Muffin Tin Mondays, and has a place to post your creations, has an admirable goal for 2011: “Getting my kids to eat healthier is not just a New Year’s resolution for me, it’s a lifestyle goal. I am daily challenging myself to think outside the box when it comes to feeding them and I think encouraging a love for healthy food is the cornerstone to building healthy eaters.” She plans to have that be part of the focus for MTMs in 2011. Today’s focus is on Muffin Tin Liners and Cups. The goal is to use only muffin tin liners and cups (rather than the actual muffin tin itself as the serving dish). The plate above is the one that I made for today’s theme. This one holds the side dishes for dinner (the girls each had a hot dog that was sliced into “coins” that they ate with a skewer and dipped into ketchup). In the center of the plate, are pink carnations that are in a baby food jar. Mondays are busy days here – and a bit hectic. In addition to “regular” homeschooling, the girls also take classes and piano lessons at a homeschool co-op for about half the day. When I get home, it seems like I’m always scrambling to put something together quickly. I knew I was going to do the Muffin Tin Meal for dinner tonight and looked forward to finding things in the refrigerator and cupboard that would fill the muffin liners. The girls were curious as to what I was making, but I told them it was going to be a surprise. When I brought the plate to the table, Olivia immediately commented, “Oh! How pretty!” They were excited about having a choice of different fruits, salads, and snacks. My only suggestion to them was that they take at least one item or a spoonful from each muffin tin liner. They were both receptive to this…probably because I don’t present their food like this every night. February will start Muffin Tin Monday’s annual Colors of the Rainbow Series. But for now…I have a week to think about what I’d like to do next Monday. Maybe I’ll try to tie it into what the girls are studying right now. Both are studying about oceans in science; and are enjoying learning about the unusual fish, animals, and plants in the deepest part of the sea, in particular. Perhaps next week I’ll do an ocean theme. 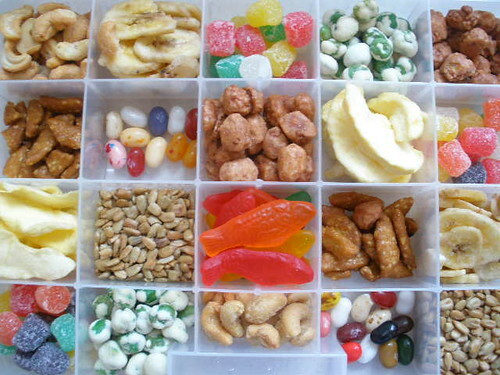 The concept of the snack box that I made for Easter gifts was that it would be a fun way to present a wide variety of snacks that could be enjoyed in a short period of time. Each person who received the snack box really like it. They are long gone now…the snacks were quickly devoured. The items in this box were: cashews, sesame sticks, dried apple slices, gum drops, banana chips, jelly beans, sunflower seeds, wasabi peas, toffee peanuts, and Swedish fish. My snack box is based on the “Muffin Tin Meal” concept. In an effort to get the girls to eat more fruits and vegetables, I needed an idea that might make these things a bit more appealing. Saw this idea in a Flickr group called Muffin Tin Meals. 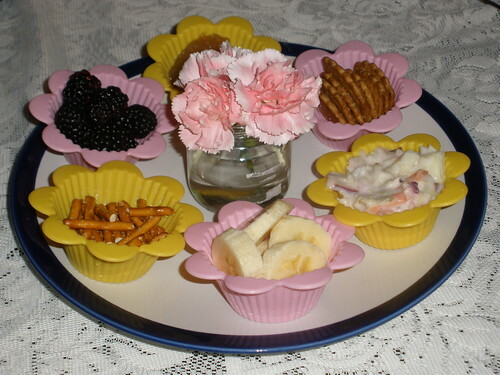 It’s a group where people upload pictures of different meals, snacks, and appetizers in muffin tins. The tins are either 12-count or 6-count. The tins can be lined with a paper muffin cup or left plain (like I did in the picture). Since Mondays are busy days with homeschooling and the homeschooling co-op, thought I’d do this idea on Tuesday instead. Thus, “Tuesday’s Terrific Tin” or “Tuesday’s Tiny Tidbits” was started…either one works for the girls. The girls were SO excited. The entire tray was gone by the end of dinner. An upcoming challenge that the group has is to create a tray based on your culture. Since my daughters were born in China, I thought it would be fun to try a Chinese-theme muffin tin. – create a Halloween-theme muffin tin. Some upcoming holidays to try could be: Thanksgiving, St. Nicholas Day, Winter Solstice, Christmas, and New Years. What kind of tin could be created for each of those holidays? Top row: green grapes, pistachios, teddy grahams, and carrots. 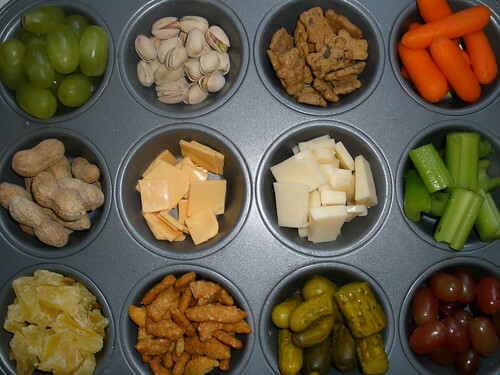 Middle row: peanuts, dairy-free cheese, Swiss cheese, and celery. 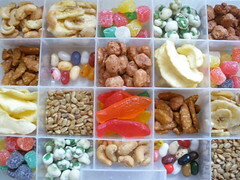 Bottom row: dried pineapple, sesame sticks, pickles, and red grapes. Everything, with the exception of the Swiss cheese, is dairy-free so my oldest daughter (who has dairy allergies) can enjoy the variety of items.